How to “bluemarbelize” Google Maps? We have processed a global irradiance and direct irradiance climate data record from the Meteosat first generation satellites (Meteosats 2 to 7, 1983–2005). The CDRs are available free of charge for all purposes from the EUMETSAT‘s Satellite Application Facility on Climate Monitoring Web User Interface at monthly, daily and hourly means at a spatial resolution of 0.03 degrees. The processing employed a climate version of the well known Heliosat algorithm combined with a open source clear sky model (gnu-MAGIC) using an eigenvector look-up table method. Modifications to the Heliosat method include a self-calibration algorithm as well as a running mean based clear sky retrieval algorithm. More information to this dataset and related algorithms can be found on our CM SAF project web site at MeteoSwiss. R. Posselt, R. W. Mueller, R. Stöckli, and J. Trentmann (2012). 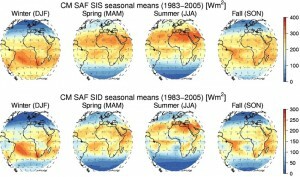 Remote sensing of solar surface radiation for climate monitoring — the CM-SAF retrieval in international comparison. Remote Sens. Environ., 118:186–198. doi: 10.1016/j.rse.2011.11.016.